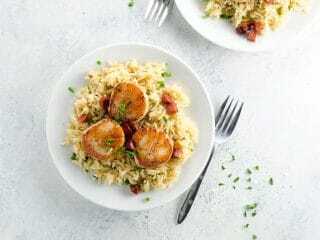 This 10-minute pan-seared scallops recipe makes a good thing even better with the addition of a little bit of Spanish chorizo. The flavor and texture contrasts with the seared scallops are just perfect. We recommend serving it all over a bed of basmati rice pilaf, another best-in-class version of a simple, killer recipe. Be sure to buy "dry scallops," which haven't been treated with additives to plump them up. Treated scallops won't taste as fresh, and they won't sear properly. Scallops, man. They're just the best. (Eating a lot of them recently has rendered me inarticulate — that's how good they are.) Seared scallops take virtually no time to make, and once you know a few basics, they're pretty hard to screw up. And yet they seem so special. I don't know how they do it. I don't care how they do it. You'll find all of this information in the recipe below, but I just want to add a quick note to say that success with scallops is at least 70% achieved at the store. Buy a pound of the freshest scallops you can find. Like all fresh seafood, they should smell good and briny like the sea. Perhaps most importantly, buy "DRY" scallops, meaning they haven't been injected with a chemical solution to plump them up. Dry scallops both taste way better and sear way better. And finally, buy "10-20" scallops which means there are 10 to 20 of them in a pound. 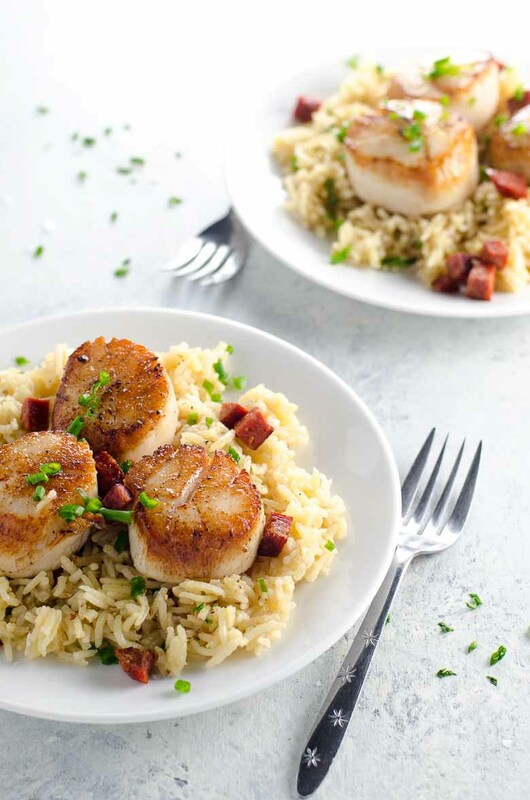 Seared scallops are a quick and easy yet special-feeling meal. Smoky, spicy Spanish chorizo adds some complexity to scallops' sweet, mild taste and some textural contrast too. If your scallops still have the little piece of muscle attached to the side, remove and discard it. (See video for technique.) Pat scallops dry with paper towels and sprinkle with salt and pepper. Dice the chorizo into small cubes (about 1/4-inch). Heat a 12-inch nonstick pan over high heat. Add chorizo and cook, stirring occasionally, until browned on several sides — just a few minutes. Remove chorizo to a bowl. Add oil to pan and keep over high heat. When very hot, add scallops without crowding. Cook 60 seconds without moving, then add butter and cook 30 seconds more. Use tongs to flip each scallop and cook just until done to your liking. I like to pull them off the heat before they're opaque in the center, which, depending on size, may mean just 30 seconds or so on the second side. To serve, place a few scallops and some of the chorizo on each plate and sprinkle with chives, if using. These are great over basmati rice pilaf.